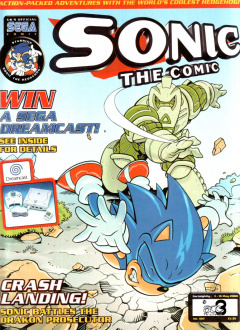 Sonic the Comic #180 is the one-hundred and eightieth issue of the Sonic the Comic series by Fleetway Editions Ltd.
Transported to the ancient past by Tikal, Sonic watches from atop a cliff as Knuckles leads an army of echidnas into battle against a lone Drakon Prosecutor. Sonic tries to warn Knuckles of the Prosecutor, though Tikal tells him he knows what he's doing and she will explain everything to him later. Knuckles and the echidnas struggle against the Prosecutor, who is easily holding his own, so Sonic steps in to help out and goes straight for the Prosecutor's head while verbally sparring with Knuckles. Eventually, Sonic is able to rip the Prosecutor's helmet off, revealing the Drakon's true form to the stunned echidnas. Data Zone: The Data Zone acts as a quick reference guide to new readers about the characters, providing data files on Sonic, Knuckles, Tikal, Dr. Robotnik and Chaos. Graphic Zone: Fan art submitted by readers. The theme for this issue's Graphic Zone is "Manic Mix-Ups! ", with several character getting mixed into single pictures. Owners of the printed art each won a Sonic the Hedgehog digital watch. A competition to win a Sega Dreamcast.